Metallic Bonding - it is not rare, but only occurs in metals in their pure or alloyed states. The out shell electrons are "mobile" in metallic bonding. The electrons are free to move about, and this is why metal make good electric conductors and can also transmit heat easily. The bonding does not produce rigid structures like the covalent model, and thus metals can be bent, flattened, or rolled fairly easily. They are "pliable" (ductile). Water in a gaseous state, in the form of fog, or clouds is not a mineral. 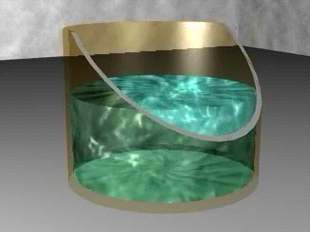 Water in the liquid state in the oceans, lakes, or rivers is not a mineral. but, water in the form of ice (solid state) is a mineral. To be a "mineral" a material must satisfy 4 rules that will be discussed below. 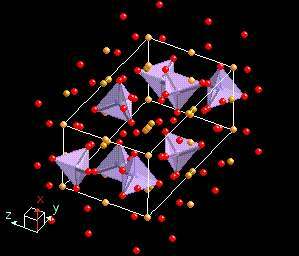 One of the rules involves the concept of crystals so we need to discuss "crystal structure" first. Molecules can exist in any of the three stares of matter demonstrated in the surrounding pictures. There is no structure in the liquid and gaseous state, the molecules have the freedom to change their location and orientation. 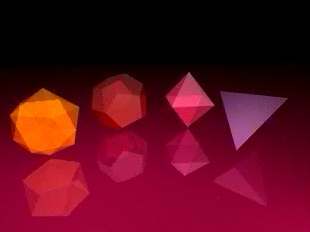 When most pure molecules form solids they come together and organize themselves into repeating structures. These structures have uniform repeating geometries and we call them "crystal structures". Crystal structures contain organized and repeating sets of the molecule, and as we will see share certain elements of symmetry. 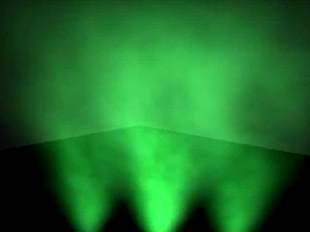 Crystalline materials have ordered structure, if a solid has no order in its structure, then it is said to be "amorphous" (from the Greek) meaning "without form". Glass is such a material. Most minerals have a crystal structure, and some are formed via ionic bonding, some are mixtures of ionic and covalent bonding, and a few are made up of strictly covalent bonding. 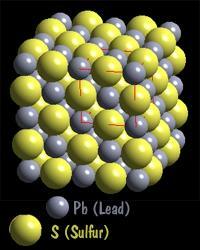 The sodium chloride we saw before is an ionic structure as is PbS (Lead Sulfide - mineral name: galena). The next mineral, Olivine, which can be either an iron silicate, a magnesium silicate, or a mixed iron-magnesium silicate has both ionic and covalent bonds. 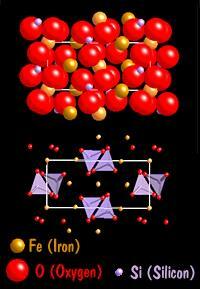 In the diagram below the SiO4 tetrahedral (purple color with red oxygen atoms) is covalently bonded, and the iron (yellow-orange color) is ionically bonded to them and the other oxygen atoms present. In our olivine mineral, the silicate group SiO4-4 acts like a single anion. It is a covalently bonded so it acts like a non changeable unit in the structure. The iron has a +2 charge and it satisfied by the silicate group forming a compound with the following molecular structure Fe2SiO4. This brings up another important fact about minerals and their structure. Some minerals can have multiple formulas (or mixed formulas). Olivine can be either made up of Mg, Fe, or a mixture of both Mg and Fe atoms as long as it has the olivine structure.